I needed the revealer to understand this theme, and it made my chuckle. On a Wednesday, that’s enough. 20a [1871 Eliot novel] is MIDDLEMARCH. I thought maybe we were doing something with positions. 30a [1924 Gershwin composition] is RHAPSODY IN BLUE. So not positions. Maybe the years mean something? 39a [2010 Bush autobiography] is DECISION POINT, which I had to get from crossings. Still no idea about the theme. 51a [1970 Harrison song] is MY SWEET LORD and now they’re no longer in chronological order. Huh? The revealer is at 61a: [Exclamation that describes 13-, 20-, 30-, 39- and 51-Across]: BY GEORGE! Of course. GEORGE Eliot, GEORGE Gershwin, GEORGE Bush, GEORGE Harrison. Nice. 1d. [ [Warning: explicit content] ] as the Times gets hip. It’s NSFW. 8d [Secretary of state during the Korean War] is Dean ACHESON. No relation to Topeka and Santa Fe. 21d [Scrape or cut] is LESION, which seems off to my ear. A LESION usually refers to a growth or abnormality on imaging. I’m sure there’s dictionary support for that, but I have never heard medical folk use the word in this way. 41d [Flying pest, slangily] is a SKEETER. We had a wet spring. We already have plenty of them. 50d [Celebratory cry] is BOOYA, with no tag for slang. Guess it’s mainstream now, and see my first bullet re: the NYT gets hip. What I didn’t know before I did this puzzle: that TAU is the symbol for torque. I leave you with this because it’s stuck in my head, and I want to share. If you’re looking for Judy Garland, she enters at 5:00. 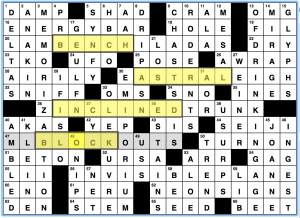 I didn’t recognize the constructor’s name, but he has gotten one puzzle published in the NYT. So while this is not a debut debut, it is a WSJ debut, so congratulations are in order! I have to say I enjoyed this one from start to finish even though I didn’t pay close enough attention to figure out the theme before completing. Once I finished and was still scratching my head, a glance at the title set me straight. Our theme answers all start with a word that can be synonymous with FLAG. And, oh hey, it’s Flag Day! 38a [Oscar-winning song from “Pocahontas”] COLORS OF THE WIND. Lovely grid-spanning find that fits the theme. In the military, the “colors” are posted and retired at the start and end of most formal ceremonies. A solid theme executed well with unassailable phrases. Nice entries, all. And some of them are partially stacked on each other without causing undue constraints on the grid. Impressive work. The fill is lovely with just a minimum of crutch entries (NOS and ONE-A being the worst of it). There’s KIM and KARDASHIAN crossing at the K if you’re into that sort of thing (I am decidedly not, but it’s certainly valid fill), but my favorite long entry is the high-falutin’ DILETTANTE. I also like PLEBE, RENOWN, LASSIE, and MT HOOD (which looks a lot like MT DOOM if you’re missing a couple letters). Also, SLEAZE and SNEEZE crossing at the Z. It just seems like there’s solid fill everywhere I look. In short, this puzzle may have a simple theme, but it’s executed beautifully, and it’s rounded out with sparkling fill and thoughtful clues making for an enjoyable ride through to the end. I loved this puzzle (which was definitely helped by seeing Wonder Woman over the weekend. It’s fantastic and totally unlike any of the other dark, gritty DC movies that have been released in the last few years – GO). 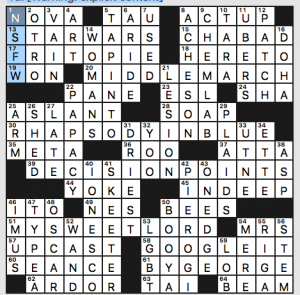 The rest of the fill in the puzzle is pretty great, given the constraints here on much of the downs – the fitting in of words like EMPORIUM and CHASSIS are pretty great. 4.5/5 stars. This was a strong showing from Francis, and I really liked what was going on in the grid here. I recently went bed linen shopping with my fiancee. I have no idea what half of the stuff is for, or what makes something a “comforter”. I didn’t see any BOTTOMSHEETs, but possibly it’s Americanese for a fitted sheet? I’m a bit clueless here! Anyway, it’s a hoary old theme trope; four answers are paired with SHEET, and here they are on the BOTTOM of the vertical theme answers. The theme answers themselves were functional: onthatSCORE, newBALANCE, bigTIME, and outofSTYLE. I note a new clue for OTTO via something called “Sons of Anarchy”; not owning a T.V., I mostly know about shows from social media buzz… [Bishops and knights], MEN; I’d have used “queens” in that clue, just for the jarring effect… I don’t think I’ve encountered a [Retailer that..], REI in or outside of puzzles – probably wise to note for future! This entry was posted in Daily Puzzles and tagged Agnes Davidson, Andrew Zhou, C.C. Burnikel, Francis Heaney, John Wrenholt. Bookmark the permalink. 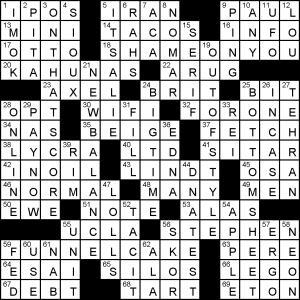 There’s actually five theme entries for the NYT, including 13A. That’s not me, but I was going to make the same point re George Lucas. Oops. Sorry. Just saw this since I just finished the ACVX head-cracker, and I blame jet lag. Yes….will not “load” for me. Worked for me just now. Thanks. AV was an impressive feat of construction, but how exactly was I supposed to get Z ________TRUNK? I’ve never heard of a zinc-lined trunk, and lack of crosses made it impossible to get. Maybe I smoked too much “the pot” to enjoy this “impressive feat of construction”. In Across Lite the clue for the revealer at 56A is too small to read because of its excessive length. The letters are checked, they’re just checked Marching Bands-style with an implied [___ plane] clue. Re legibility, you can drag the border of the solving area to the right to increase the font size. Yeah, I had the same comment to it. I got everything but that; that one entry was murderous. Wasn’t the clue, but just wasn’t going to get that without the crosses. I’m glad I solved the AV on paper. My eraser got a workout! Very lovely puzzle! lol this is a very good parody of a bad comment! Can someone help me understand what’s wrong with DRIEST? I guess I’m missing something obvious but I don’t get it. Thanks! The Atacama is the driest non-polar desert. Ice-free regions of the antarctic are drier. The question is whether “among” in the clue can mean that the entry is only one of the driest. That’s how I interpreted it. I don’t see it that way at all. I read ‘among’ as being equivalent to ‘of’ in the clue. But I suppose with either word choice that interpretation would be stronger were it preceded by a comma. So I’m just going to call it a poorly-written clue at best. Had it filled with all the planes blanked except a crucial L in LO. Only plane I had was BLOCK and didn’t know Block plane so that didn’t help. dnf on the avcx! too tough! clearly i don’t know enough planes. had STAINLESSTRUNK, even though the first S meant a British spelling on the down and the fact that a ‘tainless plane’ ain’t a thing, but i don’t think i ever would’ve seen INCLINED there with only a Z to start. also couldn’t think of the LOCK in lockout, so i was trying to fit WALK or SHUT there and getting nowhere. 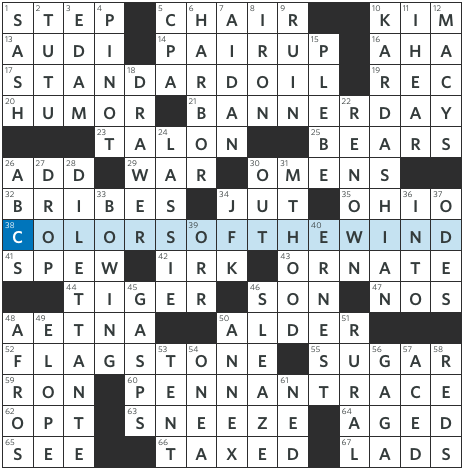 Tomorrow’s WSJ puzzle has a somewhat messed up answer key. If they repost it I’ll reconvert, but the current AL file shows the same solution as their app does, which has a few wrong letters. 2 out of the 4 PLANEs being closely related hand tools kind of stains the AVCX theme for me.